Looking for business or legal kits for yourself or your family? Learn more about our kits and buy them online! 600 Business & Legal Forms - More than 600 common and hard-to-find business and legal forms! All can be accessed using virtually any word processing program for DOS or Windows. Great for attorneys, paralegals, law students, educators, small business owners, anyone! Assorted Legal Forms Kit - An assortment of the most commonly requested legal forms in one convenient package, valid in all states. Why run up expensive legal bills when the forms in this kit can take care of the job? Bankruptcy Kit - If you have come to the conclusion that filing for bankruptcy is the only way out of burdening debt, this kit will save you time and money. The easy-to-use software contains all the "fill-in-the-blank" forms you need to implement a Chapter 7 bankruptcy proceeding without an attorney. Complete Estate Planning Kit - Prepare a Revocable Living Trust, Living Will and Last Will & Testament with this complete kit, in the privacy of your own home! Save thousands of dollars in legal fees! This kit includes all the fill-in-the-blank forms, along with easy to understand instructions. When finished, you'll have peace of mind knowing you've protected your family completely. Divorce Kit (No Fault) - Divorce can be a troubling time. But if you and your spouse have come to the difficult conclusion that divorce is the only answer, this Divorce Kit will save you time, heartache and hundreds of dollars in legal fees. It is legal and valid in all states and even comes with a money-back guarantee. Incorporation Kit - If you plan to incorporate a business, you can save hundreds of dollars in legal fees by forming the corporation yourself! Attorneys generally charge up to $1,000+ to incorporate a business. This kit includes all the documents and instruction you'll need to successfully incorporate your business, and is legal and valid in all states! Lawsuit and Asset Protection Kit - Protect your assets -- and yourself -- from litigation! We live in a "lawsuit-happy" society these days, which can put the assets of you and your family at risk. This kit, complete with accompanying software, will show you how to build a "Financial Fortress" that can make you judgment proof! Lease Agreement Kit - This package contains over a dozen different types of lease agreement forms. Just find the one that is best for your situation, fill in the blanks and have all parties sign the document. Great for landlords and tenants alike! Legal Reference Guide - If you have a legal question, the Legal Reference Guide will probably have the answer! One of the most valuable reference tools available for attorneys, paralegals, law students, government employees, law enforcement agencies, educators, or YOU! Contains THOUSANDS of pages covering dozens of legal topics in an easy-to-find format. Limited Liability Company (LLC) Kit - If you are planning to form a limited liability company in any state, you can save hundreds of dollars in legal fees by forming an LLC with this kit. It includes all the documents and instructions you will need to successfully form a Limited Liability Company in any state -- and you won't need an attorney! Living Trust Agreement Kit - Avoid probate with a Living Trust Agreement! The advantages of living trusts over wills are considerable. The process is much quicker, cheaper and more private than settling a will and it may save on estate taxes. This kit contains everything you need to create your Living Trust! Living Will Kit - With the use of this Living Will kit, decisions can be made regarding your medical and financial situation should you become incapacitated. This kit includes Living Will forms and Durable Power of Attorney forms for both health care and financial care, along with complete instructions for their use. Partnership Agreement Kit - This easy-to-use Partnership Agreement Kit enables you and your business associate(s) to draw up a written agreement legally -- without the requirement or high expense of an attorney! Included in this kit are fill-in-the-blank forms, and all of the instructions you will need to create a valid partnership agreement. Also includes an optional software version of the forms! Power of Attorney Kit - Preparing a power of attorney has never been easier or less expensive. This kit includes all the legal "fill-in-the-blank" documents you will need to prepare (and eventually revoke) your own Power of Attorney Agreement. With the help of this kit, you can prepare all of the necessary forms in less than 30 minutes, and they will be legal and valid in all states. Premarital Agreement Kit - Preparing a premarital agreement is more common today than ever before, especially with older Americans entering into another marriage. With the use of this kit, decisions can be made before a marriage takes place regarding assets and a variety of other considerations. 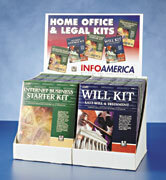 Save yourself the expense of attorney's fees with this kit! Probate Kit - When a person dies, the family need not automatically hire an attorney to handle the probate of the estate. If you have been designated as executor, this kit will show you how to handle the probate process using a copyrighted step-by-step procedure. It will save time and hundreds (or even thousands) of dollars in legal fees and attorney's costs! Quit Claim and Warranty Deed Kit - A Quitclaim Deed is one of the most important legal documents in American real estate, used to transfer ownership of real property from one owner to its buyer. This kit includes two different fill-in-the-blank Quitclaim Deed forms and a Warranty Deed, along with complete instructions. Also includes optional software. Small Claims Court Kit - If you plan to sue someone in small claims court, or if you are being sued there yourself, this kit will show you how to protect and enforce your rights. It gives you the information you need to represent yourself in the best way possible -- all without the help or the expense of an attorney! Tenant Legal Rights Kit - Most tenants do not know their legal rights and are often taken advantage of. This kit clearly explains your legal rights as a tenant. Written by an attorney, the Tenant Legal Rights Kit shows you what steps to take to legally win disputes with your landlord, and what language to look for and avoid in a lease before you sign one. Business Plan Kit for Windows - If you intend to start, buy or grow a business, launch new products, apply for a loan, or attract new investors, your company must have a business plan. You can achieve your goals by using this complete Business Plan software package. Credit Repair Kit - In today's world, good credit is important -- it gives you purchasing power. This kit will show you how to repair or establish credit as well as teach you how to set goals for yourself and how to achieve them. With a little work, this kit will set you on the road to establishing good credit for tomorrow! Debt Collection Kit - If your business is finding it increasingly difficult to collect payment on past due invoices from your customers, you need this kit. Collect monies due you in a timely manner, helping you increase your cash flow and profitability. What business can't use Debt Collection help? Email Marketing Machine - If you are marketing on the Internet and want to use bulk e-mailing for your business, this package is an absolute "must-have" item! It contains a special software program that, after installation, allows you to download more than FIVE MILLION E-MAIL ADDRESSES you can use to advertise your product! It also includes bulk e-mail software, additional e-mail address updates, and more! EZ Computer Time Clock - Your computer becomes your company time clock! Employees simply type in an assigned number, then press a button to "punch in." Later, they "punch out." Instead of totaling work hours from time cards, this Time Clock kit gives accurate, right-to-the-minute printed totals in seconds, in a variety of formats! Network Version available. Financial Calculators - This browser-based Financial Calculator program performs dozens of different complex financial calculations in a variety of categories. These simple-to-use calculators can help you make important financial decisions in areas ranging from home financing (how much house can I afford?) to retirement planning (how much do I need to save for a comfortable retirement?) A great tool! Home Sale Kit - Save yourself thousands of dollars in real estate broker's commissions by utilizing the proven techniques outlined in this Home Sale kit. Designed by experts in the fields of law, residential real estate, and advertising. You CAN sell your house without a real estate agent -- it's easier than you think! Internet Business Starter Kit - You CAN make money with the Internet! This kit will show you how! Not a "get-rich-quick" scheme, but a collection of real Internet business resources and tools to empower anyone to have a profitable business on the Internet. Perfect for a home business or it can be used to generate revenues for a business of any size. Internet Detective Kit - Any information about any person or business can be found on the Internet -- if you know where to look! Using this professional yet easy-to-use software, you will have the same web resources that private investigators, law firms and others use to track, locate, background check or screen almost anyone anywhere! You'll be amazed and astounded at what you can find with The Internet Detective Kit! Make Money with Informational Reports - Thinking about starting a business? This kit contains over 500 "How-To" business & financial reports and manuals WITH THE REPRINT RIGHTS! You own the publication rights to reprint and sell as your own -- without royalties! Includes a complete marketing program to start a mail order business right from your home! Make Money with Unclaimed Funds - Did you know there are BILLIONS of dollars in unclaimed money in the U.S.? Forgotten savings and checking accounts are just two of the categories with billions of dollars just waiting to be claimed by their rightful owners. This program shows you how you can find money or property that may belong to you, or takes you step-by-step to starting a lucrative business as a "Third Party Finder." Make Money with U.S. Government Auctions - Did you know various branches of the U.S. Government have an unbelievable amount of merchandise available at "bargain basement" prices? That is, if you know where to look. Goods include cars, trucks, boats, computers, real estate, video and stereo equipment, jewelry, and more! This Windows software program will show you how to make big money by participating in U.S. Government auctions across the U.S.A.
Resume Kit - In today's competitive employment market, it is more important than ever to be represented by a quality resume. This kit contains a simple-to-follow three step guide to composing a quality resume that is universal in design and appeal, one that is acceptable for virtually any job position. This kit will help you compose a resume that will stand out from the rest! Small Business Advisor - Imagine consulting a Harvard lawyer and a Big-Six accountant...but without the fees! That's the premise of the Small Business Advisor. This software acts as an interactive expert, offering legal, regulatory and tax advice for small businesses. Developed by Michael D. Jenkins, a Harvard lawyer and Big-Six CPA who has authored over 50 books about business success! 50 Home Businesses for People Over 50 - Home-based businesses are one of the fastest growing segments of our economy. This book was written with people over age 50 in mind who have the desire to start a business from home! The Kit contains 50 business ideas targeted at people over 50 that you can start in your home. Most can be started with as little as a few dollars.